How is your Electronic Health Record (EHR) conversion going? Could it use some TLC? As a medical professional, being urged to transfer to an EHR system is nothing new. Moving records into this format can be somewhat of a headache, but not doing so and failing to meet requirements or to comply with regulations is much more painful. Don’t stress! There is a simple fix. It’s very possible that all your sickly EHR needs is the healing power of ECM. Manage and store medical documents in an electronic format, making it easier to comply with. • Scanning applications convert paper records into electronic images, which can be accessed directly within the EHR as part of the patient file when the two systems are integrated. Therefore, one search returns a full patient view. • ECM offers the security required for private health information in compliance with Canadian healthcare regulations. • ECM can ingest almost any type of data including paper files such as signed prescription pads or handwritten orders, email messages, and electronic records from systems including insurance or accounting. • Forms processing and optical character recognition (OCR) capabilities convert information contained on an image of a paper record into usable, searchable data that can be used to populate databases or to locate a specific condition or treatment. On top of complying with regulations, you’ll see an overall improvement in the way your healthcare facility operates. ECM is designed to support this type of system, and will improve your productivity. Soon your staff will be able to search your EHR system by keyword. ECM also includes sophisticated security features that allow you to control your users’ record access to only authorized personnel. In addition, ECM can block out the personal information from a given record for those who are not authorized to see it. Best of all? The money you’ll save! In fact, Nucleus Research found that every dollar spent on ECM technology returns $6.12! The financial benefits of using ECM as a bridge technology for your EHR system go far beyond qualifying for government incentives. Does this sound like the remedy you’ve been aching for? Get going! 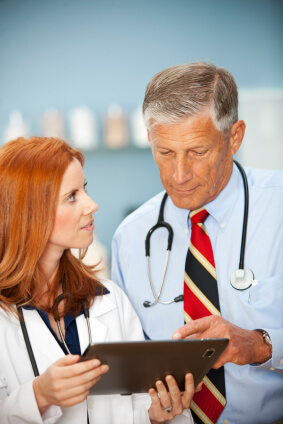 ECM could be the perfect prescription for your under-the-weather EHR system. Have something to add to this post? Share your experience with us!